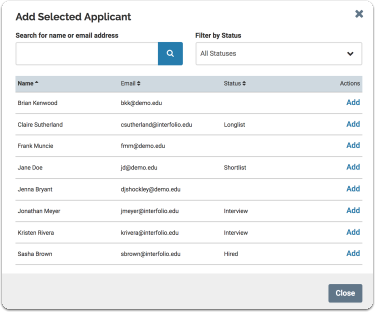 This release introduces two new features that add functionality and improvements to administrative workflows in Interfolio Faculty Search. Internal Attachments: The new internal attachments feature allows both committees and administrative staff to share information and materials pertaining to an individual application that should not be shared with the applicant themselves. In the process of considering a candidate, organizations making hires routinely produce documents about candidates that are not appropriate for that candidate to access. For example, a draft offer letter. We now provide a dedicated way for administrators and committee managers to attach such internal documents to individual applications. 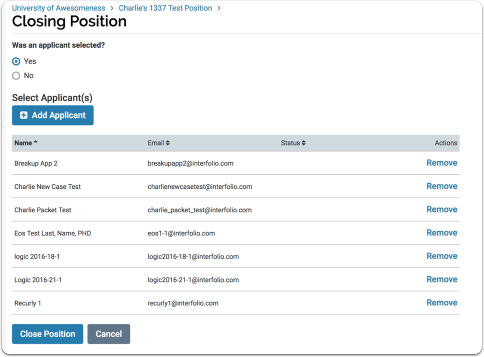 Selection approval workflows allow organizations to set up a series of approval steps that take place after a search committee has selected one or more applicants to fill a position. This allows our users to accomplish the final steps of the academic hiring process within Interfolio, provides then with new insight into academic recruitment activities over time, and empowers organizations to enforce their own data recording policies. In short, the new selection approval workflows feature is a practical tool to ensure that all academic hires follow an institution's policies about how to hire new faculty members. Administrator or Committee Managers in Faculty Search can attach internal facing documents to any individual application. Those files will be visible to users with access to that position, but are not visible to applicants. The new “Internal Documents” section displays when viewing the details (applicant profile page) of an application. Application attachments (internal facing docs) are listed in the table named "Materials"
User can download attachments or click to read them in the document viewer. Requested Recommendations will now appear in the "Internal Documents" section. User sees requested recommendations listed in the table named "Requested Recommendations"
Administrators can set up a series of approval steps that take place after a search committee has selected one or more applicants to fill a position. At each step the proposed hire is approved and sent forward, or sent back by the approver at that step in the workflow. 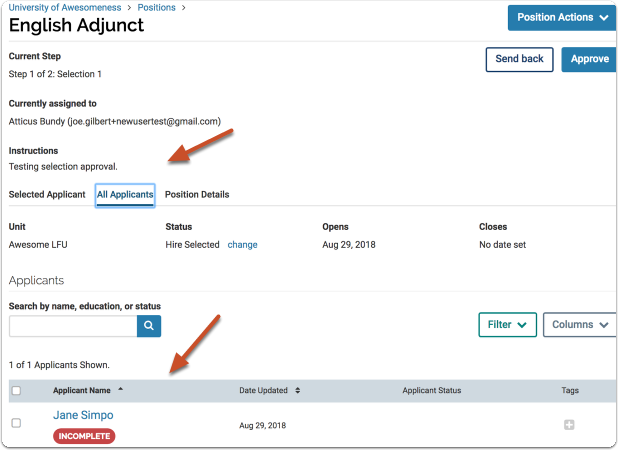 Formerly, applicants were not selected until the user hits “Close Position.” We updated this so that an applicant is selected when the select action is clicked, and the applicant is deselected when the remove action is clicked. Choose to select applicants when closing a position. If there are no selection approval steps or no applicant’s are being selected, the close position button should work as it currently does. 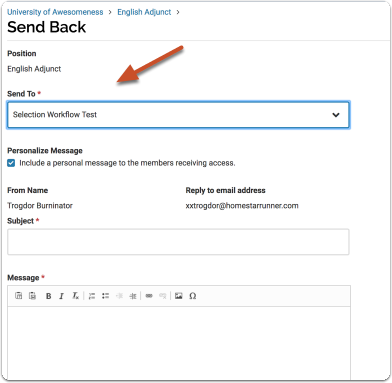 If there are selection approval steps and applicants are selected, “Close Position” button changes to “Send Selection for Approval” and navigates to a new movement page view for sending forward to a selection approval step. Note: User cannot move position forward to selection step if there are no selected applicants: CM or Admin on the Evaluation step, when no applicants have been selected, user should not be able to send forward to selection steps. User sees message: "Sorry! You must have selected an applicant to move to a selection approval step." If a position has selection approval steps, those steps are displayed at the bottom of the close position page. Can send message along with approval to next step. On the last step the movement button will say "Close"
Note that if the user has the correct permissions, they can move the selection back or forward to any workflow step, ot just the next or previous step. Institutional Administrators can see approval buttons for positions that require approval. An assigned approver for a step should see the approval buttons for the step(s) in which they are assigned. If not an assigned approver for a step, user should not see approval buttons for any position. Updated the style of the application detail (applicant profile) view to match new design. These are slight changes in the appearance of applicant profile. The main change is that we renamed the section where application materials appear to Application (instead of Documents). Documents section appears under "Application" header. Fixed issue with duplicate action items showing up for some administrative users. Positions were displaying in the list once by themselves and then again with the approval required message. When clicking on the position, they would still remain on the action items list. 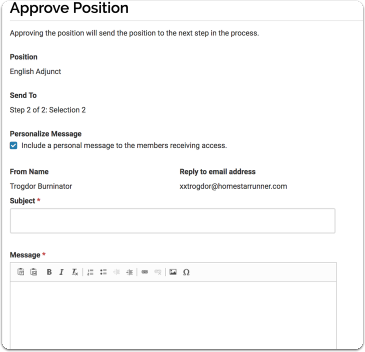 Now, the user will see all positions on a step to which they are specifically assigned as an approver or committee member/manager (and they will be flagged as necessary). The program will only display one action item per position, with the appropriate badge displaying when approval is required. Once approved, if still assigned to a step or position, the action item will display without the badge.